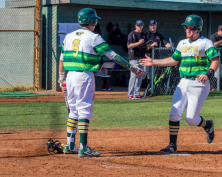 EL CAJON (3-6-16) — So far this Pacific Coast Athletic Conference season, the 20th ranked Grossmont College Griffins baseball team is looking like world beaters. The latest victim was San Diego City College on Saturday (Mar. 5) when the Griffins more than doubled the Knights up 13-6 at Noel Mickelsen Field. NOAH STROHL (La Jolla) led the Griffins (10-5, 4-0 PCAC) to their ninth straight win with a 5-for-5 performance while scoring four runs. TANNER PERRY (Steele Canyon) also scored four runs going 2-for-2 with an RBI and a pair of walks. DONOVON McCRYSTAL (2-0, West Hills) led seven Griffin pitchers on the day. Grossmont got on the board early against San Diego City (6-6, 1-2 PCAC) as they posted three runs in the bottom of the first. Perry walked with one out to get the offensive engine running. Strohl singled to center allowing Perry to get to second. JUSTEN BURKEY (San Pasqual) singled to right field bringing in Perry and Strohl wrapped around to third. The throw from the right fielder was airmailed and ended up in the Knight dugout, allowing Strohl to keep running and score. Burkey was already at second and was given third when the ball was declared dead in the dugout. TRAVOR BEARD (San Clemente) had a productive out as he grounded out to second to bring in Burkey for the third run of the inning. After City tied the game up with three runs in the top of the third, the Griffins came back and broke the game open. With one out in the bottom of the third, Perry walked. Strohl singled to right moving Perry to second. Both runners moved up on a wild pitch. Burkey then walked to load the bases. Beard doubled to right center bringing in Strohl and Perry, Burkey ended up on third. JUSTIN MITCHELL (Granite HIlls) doubled down the right field line to bring in both Perry and Burkey. CABOT VAN TIL (Patrick Henry) doubled to left center allowing Mitchell to score the fifth run of the inning and an 8-3 lead for the game. In the fourth, City had a balk-fest. Perry was hit by a pitch with one out. Strohl followed that with a single to center to move Perry to second. Both runners advanced a base on the first balk of the inning. After another out, City felt generous again and balked again allowing Strohl to score and put Perry on third. That is how the inning finished, with a 9-3 Griffin lead. Fast forward to the sixth inning. ROBERT BOSTEDT (Granite Hills) singled, advanced on a balk and took third on a wild pitch. Perry doubled down the left field line to bring him in. Strohl singled to right moving Perry to third. Strohl was given second on a wild pitch and third on a wild pitch as well. Perry was gunned down at the plate. After a strike out, Beard reached on an error allowing Strohl to score and make it 11-3 Grossmont. In the top of the eighth, City scored another three runs to make it 11-6. Grossmont tacked on another pair of runs. Burkey knocked in Perry for an even dozen runs. Mitchell had a sacrifice fly to bring in Strohl for the baker’s dozen. After enjoying a week of home cooking, the Griffins will hit the road this week. Tuesday (Mar. 8) the team travels the I-8 East to Imperial Valley. The next day, they will take a drive up the 405 to Long Beach City College for a non-conference affair. Then on Saturday (Mar. 12) I-15 and the 215 will be the freeways of choice as they visit Mt. San Jacinto. The games against Imperial Valley and Long Beach will begin at 2:00 p.m., while the Mt. San Jacinto game will be at 12:00 noon. J. Burkey singled, RBI; N. Strohl advanced to third; T. Perry scored. J. Burkey advanced to third; N. Strohl scored on an error by rf. T. Beard grounded out to 2b, RBI; J. Burkey scored, unearned. T. Flores grounded out to 1b unassisted, RBI; J. Salda advanced to second; A. Warneke advanced to third; S. Martinez scored. F. Lopez singled to right field, RBI; J. Salda advanced to third; A. Warneke scored. F. Lopez advanced to second; J. Salda scored on an error by c, unearned. T. Beard doubled to right center, 2 RBI; J. Burkey advanced to third; N. Strohl scored; T. Perry scored, unearned. J. Mitchell doubled down the rf line, 2 RBI; T. Beard scored; J. Burkey scored. C. til doubled to left center, RBI; J. Mitchell scored. N. Strohl advanced to third; T. Perry scored on a balk. T. Perry doubled down the lf line, RBI; R. Bostedt scored, unearned. T. Beard reached first on an error by ss; N. Strohl scored, unearned. F. Lopez doubled to right center, RBI; T. Flores scored. D. Dudley flied out to cf, SAC, RBI; F. Lopez scored. L. Martinez grounded out to 2b, RBI; W. Logan advanced to second; A. Hull scored. J. Burkey singled to right field, RBI; N. Strohl advanced to second; T. Perry scored. J. Mitchell flied out to lf, SAC, RBI; N. Strohl scored.